Formal letters are different to informal letters. We write formal letters to a bank, a doctor, the local council, your landlord or a company. We write informal letters to friends and family. Download the 'Your turn' document. Cut up Anna’s sentences on Page 1 and reorder them. Then rewrite Anna’s letter on Page 2. 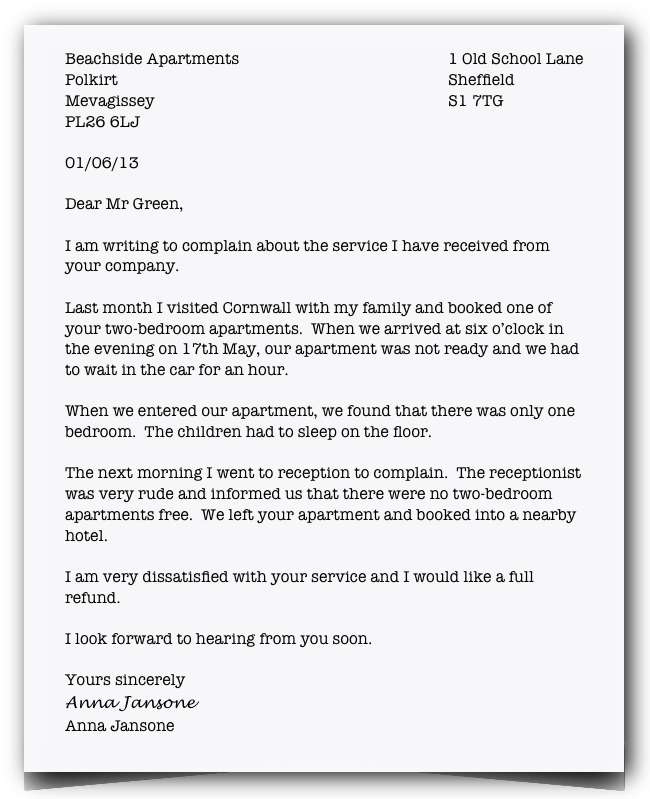 I am writing to complain about the service I have received from your company. Last month I visited Cornwall with my family and booked one of your two-bedroom apartments. When we arrived at six o’clock in the evening on 17th May, our apartment was not ready and we had to wait in the car for an hour. When we entered our apartment, we found that there was only one bedroom. The children had to sleep on the floor. The next morning I went to reception to complain. The receptionist was very rude and informed us that there were no two-bedroom apartments free. We left your apartment and booked into a nearby hotel. I am very dissatisfied with your service and I would like a full refund. What formal letters do you write in English? Thanks for the letter specimen. And what I wish to ask if the pattern is different in regard to the place of date, which I have often seen written just below the letter head.